The sound of waves crashing on the beach, seagulls cawing, and the smell of salt in the air. Start or end your day with a walk on the beach, just steps from your private estate. Spectacular, panoramic views of the ocean are yours, 24/7. 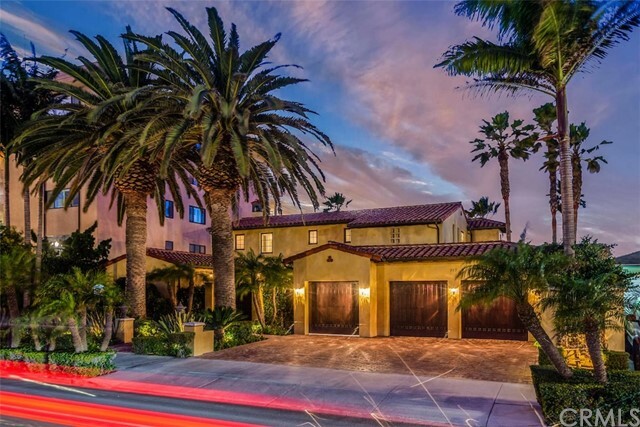 The architectural style reflects the Spanish-Revival homes that were built in the 1920s, but an extensive restoration in 2001 was designed to allow the home to accommodate the lifestyle of todays modern family. 100 feet of ocean frontage, including a private pool and spa which would be nearly impossible to duplicate today. Sequestered behind a solid wooden gate, a dramatic courtyard provides access to this 7,000 square foot masterpiece. Thick, white walls are a stunning contrast to the blue Pacific, just outside. Some of the features include a magnificent living room, a gourmet kitchen with adjacent family room, an incredible gym, a cozy library, 4 bedroom suites, each with a private bathroom, a large office, a second family room with wet-bar, and a 3-car garage. 3 laundry rooms, 5 fireplaces, and radiant heated decks are just a few of the special touches. This is life at 717 Esplanade.